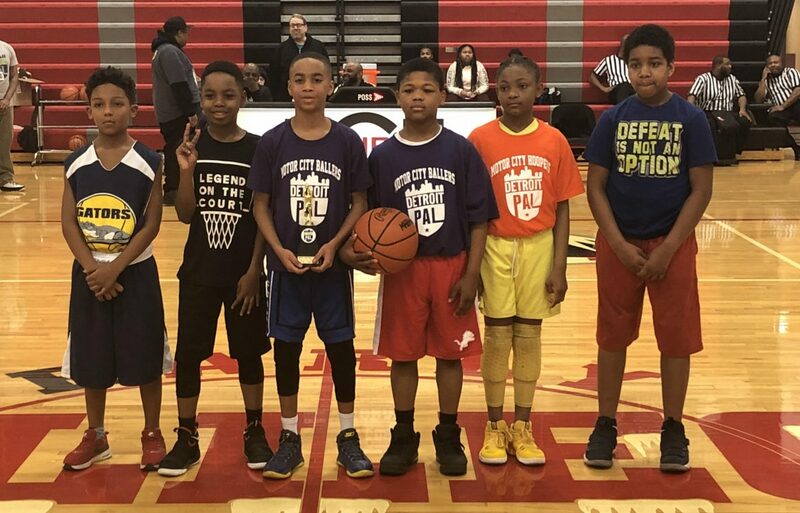 On Saturday March 10th, Detroit PAL hosted the School League All-Star games which was held at Detroit Edison Public School Academy. The top players from their respected school teams had the opportunity to team up and show their skills to family and friends on the court. There were four games played throughout the day with kids from third grade to eighth grade. During halftime of each game, there was a three point contest between the best shooters in the league and they did not disappoint the fans. The action kicked off around 10 a.m. with the first game featuring the Motor City Ballers and the Motor City Hoopers. Players from third to fifth grade were featured in the first game. Following that game was the All Star JV game with JV West taking on JV East. That game had players from sixth grade and under. The third and fourth game was the Varsity All-Star game featuring players in eighth grade and under. Game three featured Varsity B North and Varsity B South and the final game was the Spartans and the Wolverines. The first game got off to a quick start between the two teams. The Ballers had a six point lead at half time 13-7. But the second half was a different story. Both teams were neck and neck as they game was tied at 19 with about eight minutes to play. The Hoopers were able to gain momentum in the second half and they took its first lead of the game late in the second half and didn’t look back. The Hoopers were able to come out with the victory in the first All-Star game. In the second all-star game, the west side and the east side clashed heads on the court. Both teams were going back and forth to start the game off and the west was holding onto it’s lead for most of the first half. The east had a late half surge as they were knocking down shots left and right. The east took its first lead of the game with 28 seconds left to go in the first half and they went into the half with a 13-9 lead. The second half was a different story, the West was not playing any games as they dominated on the offense and holding the East to just one point in the second half. The West cruised to a double digit victory in the second game. During halftime, Derrick Miller from the East squad took home the 3-point contest crown. The Varsity All-Star game featured players from eighth grade and under. You had the North squad battling the South squad. Both teams were very competitive and a lot of talent was displayed during this game. The South took command in the first half and they were able to keep the lead throughout the came as they were able to hold off the North team in an exciting game. History was made during the 3-Point contest as Jacob White from the South team hit 12 three pointers in one round which set a new record in the 3-Point contest. White also took home the crown. In the final game of the day it was the Varsity A All-Star game which featured the Spartans and the Wolverines. Much excitement in this game as well and both teams were going back and forth. The score was tied at 10 with six minutes left in the first half and the Spartans were able to break away from the Wolverines taking a 22-18 lead at half. The Wolverines made a comeback in the second half as they cut its deficit to three at 31-28. Momentum was on the Wolverines side as they took a 37-33 lead with five minutes left to play. But the Spartans were not going away easily, it was a three point game with 47 seconds left 41-38 Wolverines. The Wolverines were able to hold off the Spartans and secure the victory. Calvin Marshall of the Wolverines was the 3-Point champion. Pictures are up on Facebook.